Design 3428, the latest addition to our ever-growing selection of custom created engagement rings is inspiring everyone here at Knox Jewelers. This completely from-scratch custom creation seamlessly combines a timeless top view with intriguing and intricate profile view filigree curls. The unique center diamond setting is constructed from curving filigree but remains a classic four-prong setting from the top. Glittering bead-set diamonds framed by milgrain edging line the flaring band. This one-of-a-kind design centers around an elegant emerald cut diamond. The rectangle shape and dramatic lines are the perfect juxtaposition against the pedestal of filigree that supports the center stone. Knox’s ability to bring any dream engagement ring to life is illustrated in this breathtaking custom piece. A timeless outline with surprising details is the perfect way to describe Design 3428. Knox hand finishes and outstanding craftsmanship will ensure that this emerald cut diamond engagement ring will last a lifetime. This stunning bead-set diamond and filigree curl design can be recreated to accommodate any type, shape, or size center stones. Contact Knox Jewelers today to custom tailor this design to your preferred precious metal and central gemstone selection to create your own unique engagement ring! Our new favorite custom created engagement ring features a trio of striking blue lab created round sapphires woven amidst a band of micro pavé set diamonds. This ring is crafted in 14 karat white gold. 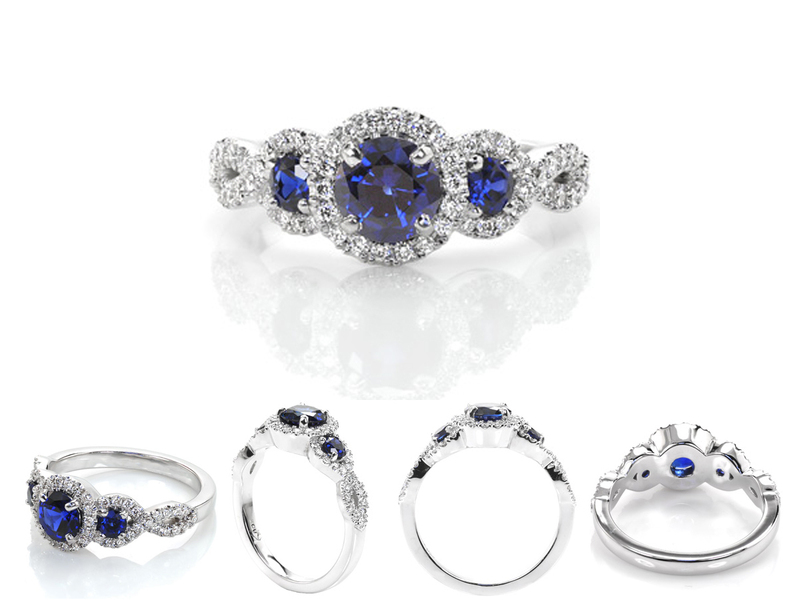 The bright white metal adds a striking contrast against the vivid blue sapphires. Its micro pavé diamond band winds seamlessly around the three round cut sapphires creating a unique interlacing triple halo design. Each sapphire is set within four prong inside their diamond halos. This braided design can be recreated to accommodate any type, shape, or size center stones. Contact Knox Jewelers today to custom tailor this design to your preferred precious metal and central gemstone selection to create your own one-of-a-kind engagement ring!